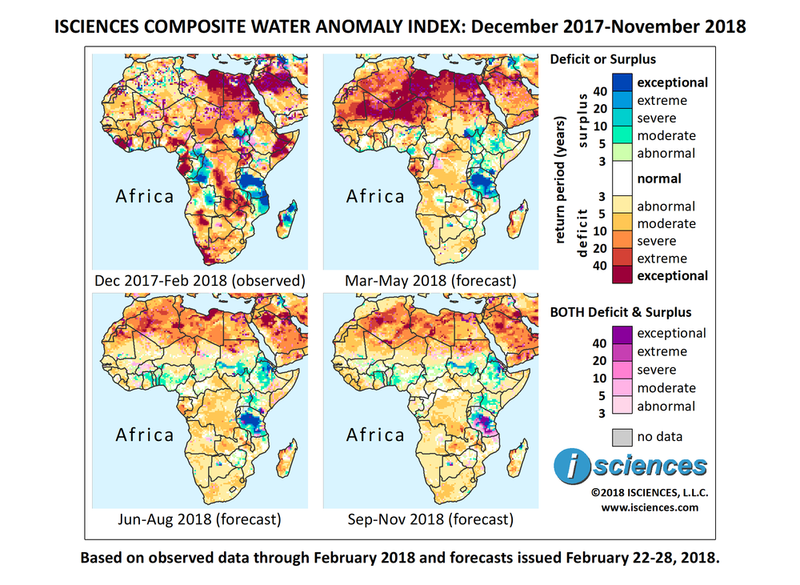 The 12-month forecast (below) indicates severe to extreme water deficits across much of northern Africa, with exceptional deficits in southeast Algeria into central Libya and along much of Libya’s coast. Exceptional deficits are also forecast for Gabon, central Malawi, west-central Madagascar, and western South Africa. Significant deficits are forecast for Zambia, and deficits of varying severity are forecast for Democratic Republic of the Congo, northern Namibia into Angola, and southwestern Madagascar. Surplus conditions are forecast for nearly all of Tanzania, and will be exceptional in the center of the country. Surplus is also forecast for southern Sudan, the White Nile through South Sudan, Eritrea, Ethiopia, the Victoria Nile and eastern Uganda into Kenya, northeastern Mozambique, northern Madagascar, far western Democratic Republic of the Congo, and east-central Angola. The forecast through May shows widespread, intense deficits emerging across northern Africa, including Mauritania, Mali, Niger, Algeria, Libya, Egypt, and northern Sudan. Further south, the extent and severity of deficits in Gabon will decrease slightly but severe to exceptional conditions will persist. Deficit conditions are expected to transition to near-normal in Liberia and the Horn of Africa, while conditions in central and southern Africa downgrade, leaving primarily moderate deficits in DRC, Angola, Zambia, and northwestern Namibia. Deficits will continue to emerge in Guinea Bissau, western Burkina Faso, northern Ghana, northern Ethiopia, eastern Central African Republic, and western and southern Madagascar. Intense surplus conditions will continue to emerge in Tanzania, and surpluses of varying severity are forecast for Uganda, Kenya, eastern South Sudan, southeastern Sudan, and southern Ethiopia. Previously observed surplus conditions in western DRC and nearby countries are forecast to nearly disappear. After May, deficits across northern Africa are expected to shrink and downgrade in intensity, though exceptional deficits remain in the forecast for Libya’s northeast coast including Benghazi. Deficits will downgrade in Gabon also but severe deficits will persist. Moderate deficit conditions will continue to emerge in DRC and may emerge in western South Africa. Some pockets of severe deficit will persist in Zambia, Malawi, and western Madagascar. Moderate surplus conditions will emerge in an east/west belt across Africa from northern Côte d’Ivoire through northern Ghana, Togo, Benin, Nigeria, southern Chad, and southern Sudan. Surpluses will also emerge in southern Eritrea. Northern Ethiopia will transition from deficits to extreme or even exceptional surplus, while moderate surpluses persist in the central and southern regions of the country. A significant block of exceptional surplus is expected to persist in Zambia, with moderate surpluses persisting to the north in eastern Uganda and western Kenya. The forecast for the final quarter – September through November 2018 – indicates conditions similar to those forecast for the preceding three months. After months of worrying about when "Day Zero" would arrive in drought-stricken Cape Town – the day in which water taps would be turned off – it's now likely that the city of nearly four million people will avoid running out of water this year at least. If consumption can be limited to 50 liters (13 gallons) per person per day, says a city official, Cape Town can make it to August when the region typically enters a period of "normal rainfall" and possibly into 2019. The South African government declared the drought a national disaster, enabling easier direction of resources for relief and recovery. The impact on agriculture in Western Cape Province is estimated at 5.9 billion rand (500 million USD), as output is expected to be cut by 20 percent, along with 30,000 jobs. The extent of severe and lasting economic impacts will depend on the length of the current crisis, warns credit rating business Moody’s. South Africa's parliament expects to begin an inquiry into allegations of mismanagement by the national water ministry that have arisen during the crisis. Controversy has also arisen over plans to tap aquifers under Cape Town's Table Mountain to provide water, a move ecologists say would threaten the unique biodiversity of the Cape Floral Region, a UNESCO World Heritage site. A ministerial meeting between Ethiopia, Egypt, and Sudan over Ethiopia’s Nile River mega-dam was postponed, in yet another setback, after Ethiopia’s prime minister announced his resignation following years of violent protests against state corruption. The Grand Ethiopian Renaissance Dam, set to be the largest hydroelectric dam in Africa, has been a source of tension in recent years between Ethiopia and downstream neighbors Egypt and Sudan. Egypt is projected to experience water shortages as early as 2025, and while Sudan may benefit from cheaper electricity, its water allocation treaty with Egypt could be disrupted as Nile flows are altered. Talks were last held in November 2017, but resulted in no agreement on the timeline for filling the dam’s reservoir. Botswana is expecting food deficits and higher imports as a two-year drought has reduced planted acreage by 75 percent. Drought and desertification are exacerbating farmer/herder conflict in Nigeria, displacing thousands. By some accounts, the death toll - 2,500 in 2016 - has passed that attributed to the terror group Boko Haram. Heavy rainfall in East Africa has produced flooding in Tanzania, Uganda, and Kenya. Officials estimate that floods costs Tanzania US$2 billion each year, repeatedly ravaging the rapidly growing capital Dar es Salaam and its 5 million residents where four people have died in recent flooding. The onset of the rainy season flooded Kawempe Hospital in Kampala Uganda, with water flowing through windows in one ward and collapsing part of the ceiling in the $11.3 million facility. In Kenya, a third of the usual March rainfall fell during one day in Nairobi, disrupting traffic and calling attention to the city's drainage system, challenged by increasing population. Fifteen deaths have been reported around the country due to flooding. Since the beginning of the year, nearly 8,500 cases of cholera, a water-borne disease, have been documented in eastern and southern Africa, including Zambia and Malawi.